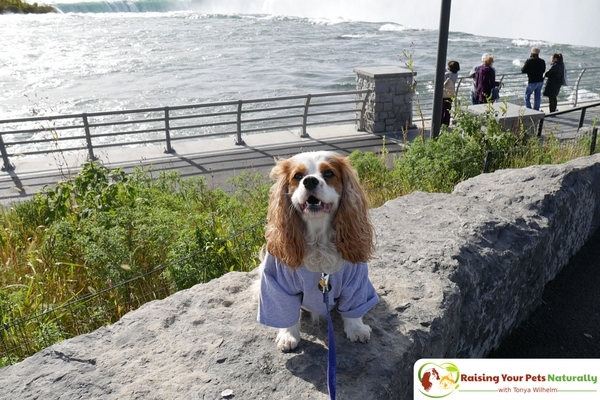 After our dog-friendly Vermont vacation, we decided a trip to Niagara Falls was in order. I mean, we were basically going to drive through New York to get back home. 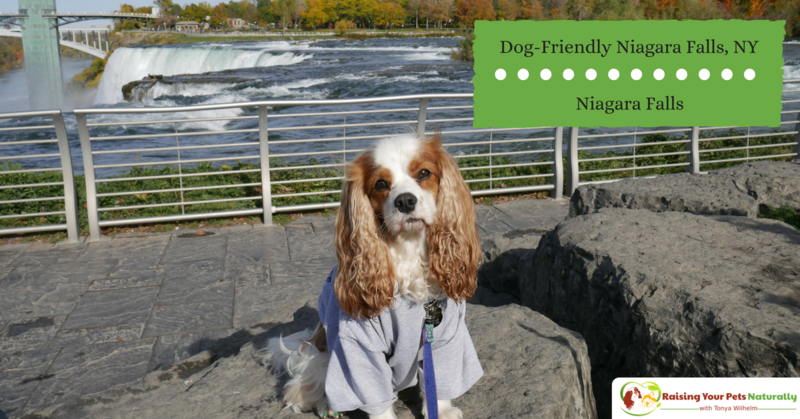 The first question was, “are dogs allowed at Niagara Falls?” I was super excited to learn this was a big yes! Okay, dog-friendly New York, here we come. We visited Niagara Falls USA on our way home from Vermont. 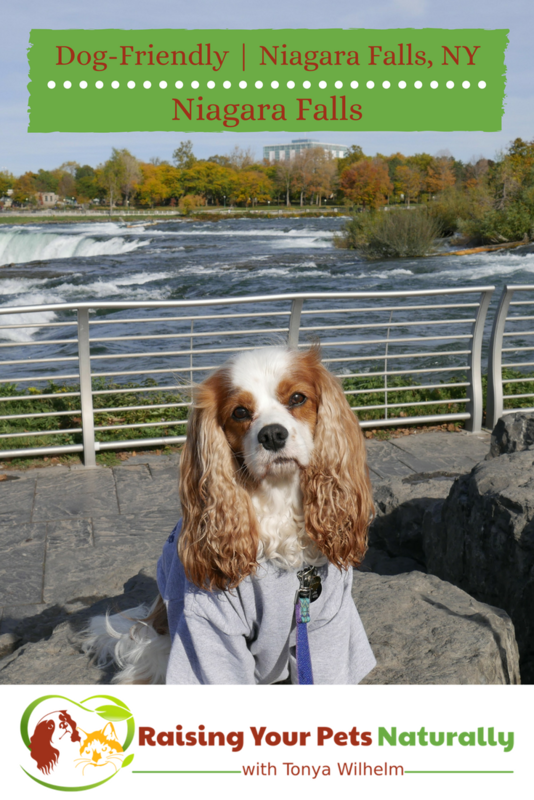 Since our dog-friendly trip to Niagara Falls, New York was during the off-season and on a week day, we almost had the park to ourselves. Don’t get me wrong, there were definitely tourists and small families, but it was not busy or packed, which I really enjoyed. Niagara Falls State Park is open 365 days a year, 24 hours a day. But no outdoor concerts, festivals, or entertainment were happening during our trip, and even the eatery was closed. That was a bit disappointing. The landscape was very nice, even though things weren’t in their spring or summer bloom. With over 400 acres of landscape, wildlife, attractions and of course, the Falls, Niagara Falls should be on everyone’s bucket list. Niagara Falls offers some really interesting attractions such as the Maid of the Mist and Cave of the Winds. However, these are not dog-friendly, so we did not partake in those adventures. However, we did explore the park through the various paved paths, saw the Falls from different viewpoints, and there are lots of great water features throughout the park. There are actually two USA sides of Niagara Falls, Goat Island and Luna Island. We chose to visit Goat Island and we were glad that we did. We were able to see the rapids, Three Sisters Island, Bridal Veil Falls, and Terrapin Point. It was wheelchair, or dog stroller accessible, so it was perfect when Dexter became too tired to keep walking. After a few hours exploring the park, we headed back to our dog-friendly hotel for a little R & R before coming back for Niagara Falls Illumination. 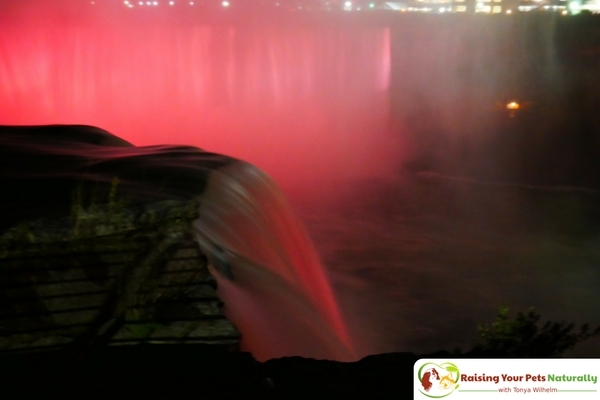 Niagara Falls Illumination is an amazing light show over the falls every evening! This special event has been impressing visitors since 1925. And impressive it was. The range of colors throughout the falls was breathtaking. I’m really disappointed I’m didn’t have better photography skills to really capture the spectacular show. They even have a special Niagara Falls Illumination Board (NFIB) to manage this attraction. The NFIB also helps raise awareness for special causes through special Niagara Falls light show requests. That’s really a neat idea! 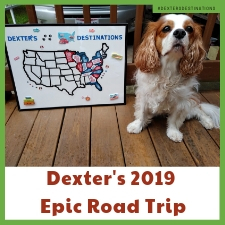 At the end of the dog-friendly day trip, Dexter and Levi were beat! Chris and I really wore these two Cavaliers out. 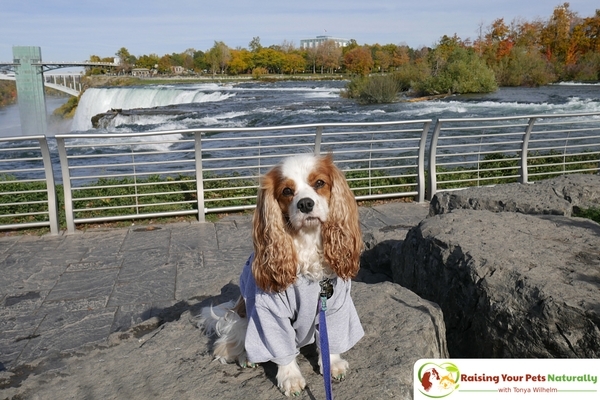 If you and your dog enjoy a good adventure, I would recommend checking out Niagara Falls. It truly is a breathtaking attraction. 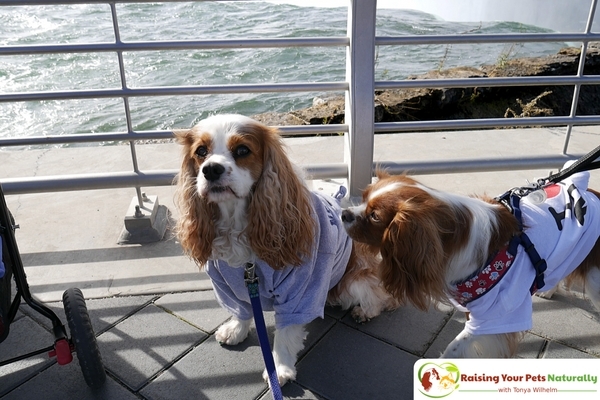 Have you ever visited Niagra Falls with your dog? Tell me in the comments. Vacation with your dog is the best moments!!! In this weekends I will try Niagara fall, It looks amazing. Oh, good. I was so much fun. Beautiful at night. This is really awesome! I’m glad that there are some dog-friendly Niagra Falls areas in NY. It’s about a 7-hour drive for me, so I would most certainly want to stay and bring my pug! You should. It was lovely. I’m hoping to get back in a bit warmer weather so we can investigate more of the area. We were just at the Niagara falls Canada side June this year and it was amazing! It’s great to know that you can actually bring your dogs. We’re hoping to visit again probably by next year. It’s such a great destination. I visited the Canada side when I was a little girl. That’s so cool that they had great places which were dog-friendly in Niagara. I know my Oreo would love going on a trip like that to the falls. You should take Oreo. I bet your kids would love it! This is great! 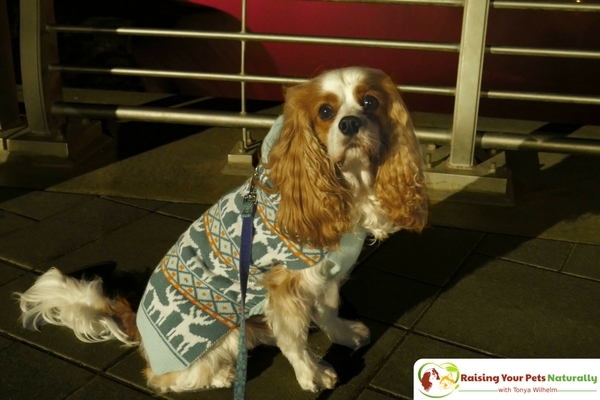 I love the sweater and shirt you put on your dog. I’m glad this could truly be a family trip. Thank you Gill. Yes, it was chilly and they needed to be warm. We had so much fun. Such lovely pictures of Dexter and Levi. They are adorable. They must be so lucky to have you as their caretaker that you think of their enjoyment at this level. 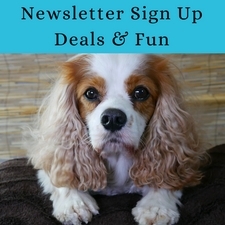 Great informative blog for pet lovers! Thank you so much. They make so many people smile, they deserve the best. I haven’t been to Niagara Falls yet. It’s not that far so I need to take my daughters. The red lights hitting the water were picturesque. Thank you. It was a stunning sight. As a furparent, I truly appreciate dog-friendly places. 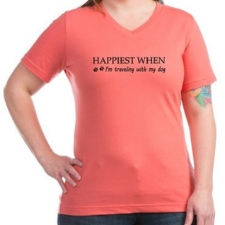 And it would be a dream to travel with my 13-year-old Maltese named Crumpy to Niagara Falls. I am certain that he will enjoy this place just like our last trip where we tried riding a zip line. Thank you. 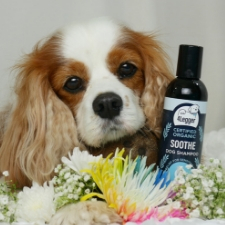 Crumpy sounds like an amazing dog! 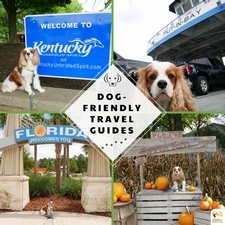 It’s such a great experience when traveling with dogs. There’s something unique about the adventure.